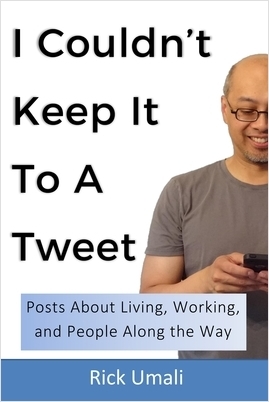 I'm planning to self-publish a small collection of my best BLOG posts. The title of this will be "I Couldn't Keep It To A Tweet". I've been writing in my BLOG since 2001. There are almost 800 published posts, though the bulk of the entries were written before 2012. (Also, over a 100 were just the length of a tweet.) Since 2012, I've committed to writing once a month. At some point I went through all of my posts and identified about 40 memorable entries. This is most certainly a vanity project, the kind that today's electronic publishing world allows you to do. If you haven't bought my computer book, then I hope you'll consider buying this one! Look for it on Labor Day weekend.